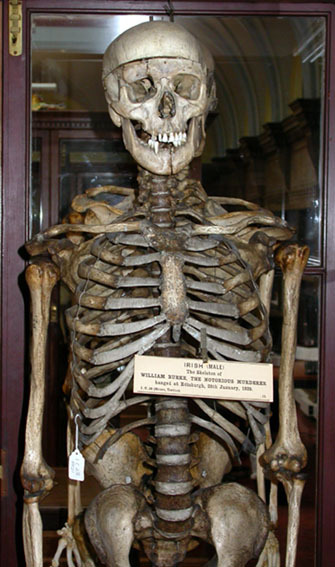 The skeleton of William Burke. William Burke and William Hare were murderers who went on a 10 month killing spree in 1828, and sold the bodies of their 16 victims to Dr. Robert Knox, an anatomy lecturer, to be dissected at the medical school. Prior to the Anatomy Act of 1832, medical schools could only dissect the bodies of executed criminals, and it was illegal for them to anatomize donated bodies. Since the demand for bodies exceeded the supply of executed criminals, lecturers had to resort to doing business with unsavory characters, like Burke and Hare. Via Wikipedia. Calling card case made out of Burke’s skin. Burke and Hare weren’t caught until two guests at the boarding house, Ann and James Gray, grew worried after another lodger, Madgy Docherty, disappeared under suspicious circumstances. As soon as the couple was left alone in the boarding house they searched and found Madgy’s body under a bed and alerted the police. There maybe honor among thieves, but the same can’t be said about murderers. Hare was offered immunity if he testified against Burke, a deal he promptly took. Burke was tried and found guilty of murder and sentenced to death. Burke was hanged on January 28, 1829 and his body was publicly dissected at the medical school, then his bones were defleshed and his skeleton was put on display. Burke’s death mask and skeleton, as well as Hare’s life mask are all on display at Anatomical Museum at the University of Edinburgh. A calling card case made of Burke’s skin (why?) is on display at the Police Museum in Edinburgh. May I suggest you get your facts right? Burke and Hare were not body snatchers (or resurrectionists), they never took or stole a body. They were murderers. At the time of Burke’s execution, a criminal’s body would have been hung up on display in an iron cage (on a gibbet) as a warning to others. The judge thought that Burke’s crime was so horrific that gibbeting him would befoul the city. Dissection was part of the sentence and his remains were to remain on display ‘for all time’. The same applied to John Howison, the Cramond Murderer, who shares Burke’s display case.